The community of Smithers was founded in 1913 as the divisional headquarters of the Grand Trunk Pacific Railway. The community took its name from Sir Alfred Smithers, the chairman of the board of directors of the railway. Alfred Avenue is also named after him. Lake Kathlyn, one of the most familiar spots in the Smithers area, is named after Sir Alfred's daughter. 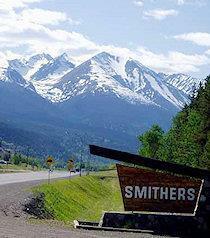 In 1921, Smithers was designated as the first incorporated village in British Columbia. Development of local mineral and agricultural resources were encouraged and a steady economic growth was realized. In 1967, Smithers moved from the status of village to incorporated town. Pioneer settlers made Smithers their home because of the fertile valley soil, abundant mineral riches, and imposing coniferous forests. Many of the non-traditional names of mountain ranges in the area reflect the prospecting efforts of the early settlers, including Silver King Basin. Following World War II, many Europeans--especially Dutch and Swiss families--immigrated to Smithers. We thank the town of Smithers for allowing us to use this information from their website. The Town Hall in Smithers is a useful place to get all sorts of information about the Smithers area and for contacts in the local business community the Chamber of Commerce has the necessary information. For those living outside of the municipal boundaries of Smithers, the Regional District of Bulkley Nechako is the place to go to for information. Families with children will find the local school district website a useful place to get information about schools and school buses in Smithers. Northern Health provides lots of information about health facilities in the North.